My name is Tracy McLean (nee Mills) and in 1980, I was lucky to be chosen by the Rotary Club of East Coast Bays, Auckland, NZ (in then District 992, now 9910) where my father Don was a member for over 25 years, as a Rotary Youth Exchange (RYE) student, and spent 12 months in Grahamstown, South Africa. I had one of the best years of my life and continue to keep in touch with both Rotarians and friends from that time. I returned in 1981, completed my nursing degree, married Steve and we had three gorgeous children. What I didn’t realise at the time, was the ongoing impact that Rotary, and in particular RYE, would have on my life. Steve, my husband, joined Rotary in Wellington in 1994, and we then moved to Queenstown where he joined the Rotary Club of Queenstown. He has been a Rotarian for 20 years, President, and Assistant Governor of District 9980. He and I served on the District Youth Exchange Committee for 10 years, and have both received Paul Harris Fellow recognition from the Queenstown club. 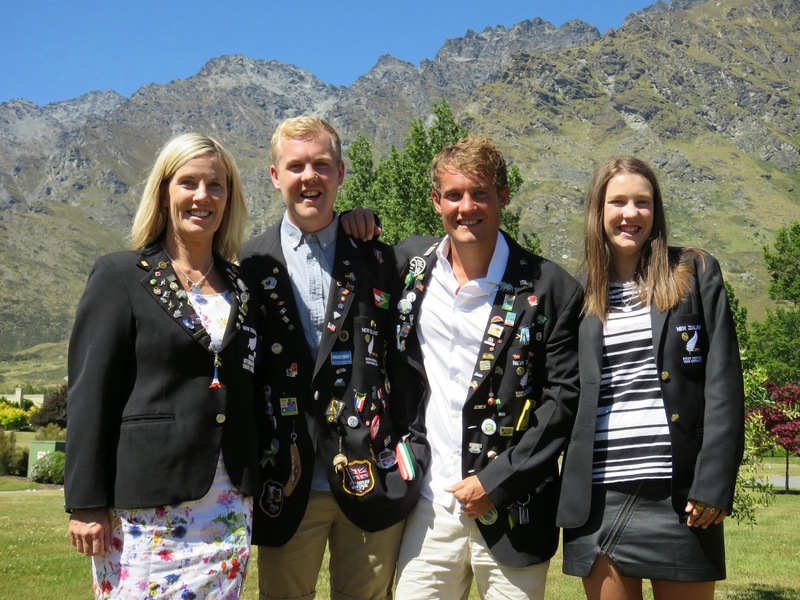 We have hosted six RYE students ourselves, and each of our three children have embarked on a year away as a Rotary Exchange student, all sponsored by the Queenstown club. Our youngest, Mikaela (18 years-old) is currently on exchange in Sweden. Her eldest brother Matt went to Austria in 2004, and Rob followed to Denmark in 2007. I am not sure if there are many families who can boast a parent, and every child having enjoyed the joy of Rotary Youth Exchange. We took this special photo in January, when all three were at home before Mikaela left for Sweden. I am very pleased my blazer still fits! I even found my return speech in the pocket on very yellowed paper... where did 35 years go ? When I was heading away, NZ students didn't have blazers, but Dad organised mine because of the long around about way I travelled due to airline sanctions with South Africa at the time. It ensured that I was recognized at airports as a Rotary Ambassador under the Youth Exchange programme. It helped me in Frankfurt, Germany on a nine hour stop over, but that is another story! I am fairly sure I was the first NZ student to don a blazer with the silver fern. So the blazer a student wears is a very special momento. Matt is now a successful Journalist for TVNZ based in Auckland, Rob is following his Valuation and Property Management degree working in London, UK and Mikaela hopes to study at Victoria University in Wellington on her return. Sweden is proving a special place for her, and we know what she has in store as the year unfolds. The ongoing international connection keeps popping up. Rob was hosted in Denmark, and his host brother at the time, Rasmus, happened to have been in NZ the year before, and guess what? He was hosted by the Rotary Club of East Coast Bays which sponsored me some 30 years before. Another story I often tell, is 10 years after I came home from South Africa, my brother was in the UK on his OE and had been invited to play a game of touch rugby. He got chatting to one of the other players in the pub afterwards. It transpired that these two men, talking in a pub in London, in 1990 were my “real brother” and my “host brother”. A New Zealander and a South African who through Rotary Youth Exchange were shown how small our world can be. Rotary changed my life, and I hope that I have given a little back to the organisation that opened my eyes to the world, and to the generosity of Rotarians. Our connection to the youth that pass through this organisation shows the talent and the leadership that comes from this programme. We continue to keep in touch with the students we have hosted, from all parts of the globe. I encourage Rotarians to keep this programme strong, and continue to host and sponsor students to explore the world through Rotary. I have certainly gained far more than I have given to this programme. Our family has been blessed beyond measure. Thanks Rotary.